‘GYPSY’ 20 Years Later: Celebrating Strong Women « How Do You Measure 525600 Minutes? Twenty years ago, I had the pleasure of directing the Jule Styne, Stephen Sondheim and Arthur Laurents musical, GYPSY for Elgin Summer Theatre at Hemmens Auditorium in Elgin, Illinois. It was the combined effort of the City of Elgin, Independent Players and the Elgin Theatre Company (then, Elgin Community Theatre). It was a big, colorful spectacle that I’ll always hold close to my heart as one of my most important professional accomplishments that had a huge lasting impact on my personal life. 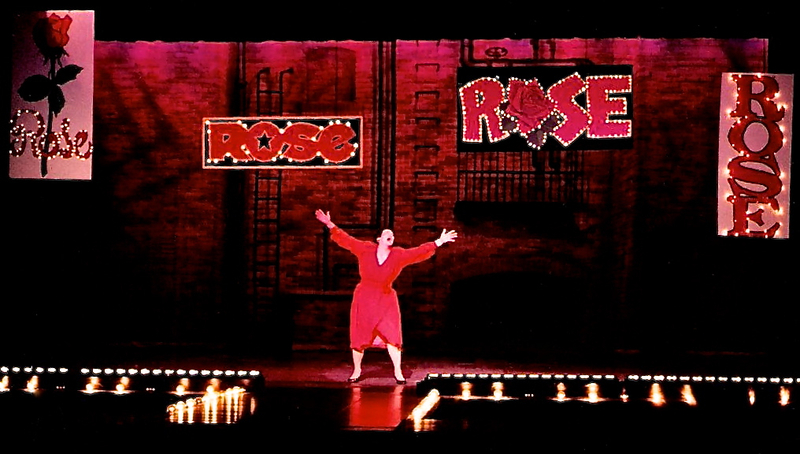 Peggy Pipilis as Mama Rose in the 1993 Elgin Summer Theatre production of Gypsy. For those of you not that familiar with the show– it coined the phrase, “Sing out, Louise” and introduced the legendary “mother of all mothers” — the biggest stage mom of them all, Mama Rose. The character was originated by stage icon, Ethel Merman, in 1959 and later portrayed on film by Rosalind Russell. There have been many famous Mama Roses over the years including Angela Lansbury, Tyne Daly, Bernadette Peters and most recently: the sensational Patti LuPone. In the story, single mom Rose foregoes all hopes of a normal life for her two daughters, pushing them in the dying vaudeville circuit, only to have her eldest (her star) leave her. In one last-ditch effort, Rose forces her younger, less talented daughter Louise to become a stripper. That stripper became perhaps the most famous of all time, Gypsy Rose Lee. Rose was blinded by stardom. If not for her, then for her daughters, no matter what the cost. I’ve had this blog post mulling around in my head for a couple months now. i just wasn’t completely sure how I wanted to approach it… until last night. Last night, I was reunited with a very good friend I hadn’t seen in almost thirty years. When our friendship began all those years ago– I remember her being a strong, level-headed influence in my life. Of course we reminisced about the old days, last night but more importantly, we started to get caught up on our lives since. Tara is indeed, still the strong, intelligent woman I remembered (and missed) from so many years ago. I’ve been blessed to know many strong women over the years– which brings me back to our production of Gypsy and start of probably the greatest friendship of my life. Peggy and I met working on a previous show but didn’t connect on a personal level until production of Gypsy started. She was (and is) my Mama Rose. I was still living in Chicago at the time and Peggy offered to drive me to the train station after rehearsals each night, giving us extra time to talk about her role and quickly establishing a tight bond that went far beyond a typical actress-director relationship. We just clicked. I can’t even begin to go in to all the adventures we’ve shared over the the years but her family is my extended family. I think I’ve probably shared as many, if not more holidays and special occasions with them than with my own immediate family. Our friendship and the relationship with her family, to me, is an example of what life is all about. Gypsy also brought at least four other strong women into my life that have made a lasting impact on me. Two are brilliant single moms that single handedly raised amazing children; one is the most positive cheerleader I’ve ever known; and a wonderful performer, now teacher, that I was fortunate enough to reconnect with recently and is doing incredible work training future young artists. All strong women… all with unique challenges and circumstances… all important role models in my life. All of us take our connections and circumstances for granted at some point in our lives. We seldom know what relationships or events are going to have the biggest, lasting impact on us at that time. This is why it is so important to cherish the moments, the people and the opportunities while they are happening. I’ve been reminded time and time again over the past few weeks exactly how important those experiences are in making me who I am today. By jlinamen1229 in Family, Lifestyle, Personal Growth, Social Networking, Uncategorized on August 1, 2013 .